A second opportunity related to larger fires focuses on the relationship between area burned (as reported in Federal and state records) and structures lost (as reported in the nationwide ICS-209 incident reporting system). An index of the rate at which structures are lost relative to the area burned was created and compared to the area burned itself. A four-color map reflecting the intersection of those two indices reveals an interesting pattern (Option 9, figure 3.17). The combination of high rates of structure loss with low area burned is dominant in the Central Plains and Eastern regions. Prioritizing response resources towards structure protection in these areas seems prudent. Conversely, the Intermountain West exhibits most of the area with high rates of area burned, but relatively lower rates of structures lost per unit area burned. The opportunity to employ greater flexibility in the tactics used in suppressing and containing fires in this region might be explored. Greater flexibility could lead to enhanced ecological benefits, reduced overall suppression costs, and perhaps less direct risk to firefighters. 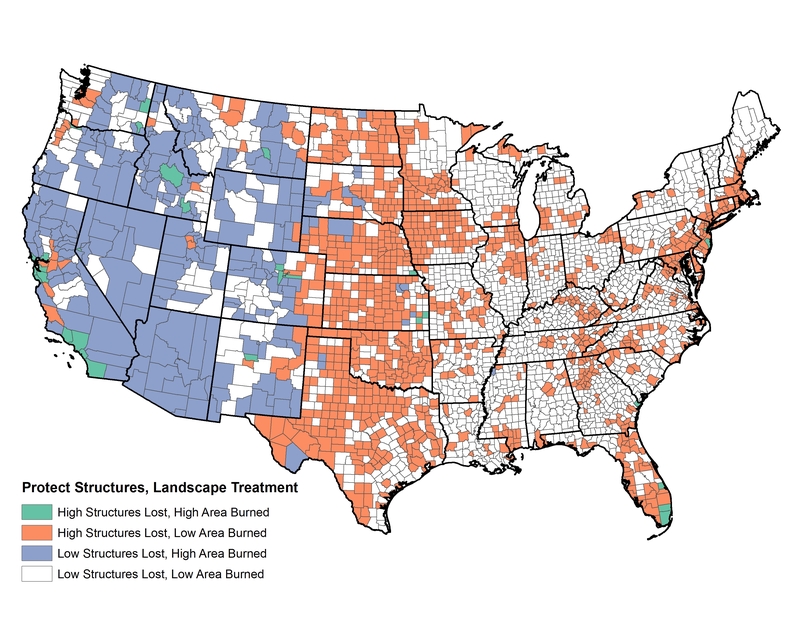 Counties exhibiting a combination of both high area burned and high structure loss rates are few in number, but highlight some of the most problematic counties in the Nation from a response perspective. Management efforts to simultaneously emphasize structure protection in combination with efforts to reduce fire size through either increased response capacity or pre-fire fuels management seem warranted.